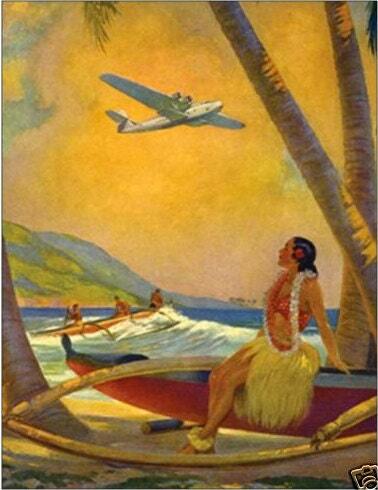 Pan Am Clipper departs Honolulu, Dec.7th, 1941 - A stunning Art Deco image of another time. SIGNED AND NUMBERED BY ARTIST AND ART PUBLISHER, DANIEL VANCAS. LARGER CANVAS GICLEE UPGRADES OFFERED! "LAST FLIGHT, BOEING 314 LEAVES PEARL HARBOR, DECEMBER 7TH 1941"
I don't just paint pinups... I paint other things of interest to me. This painting of 250 layers took me over two years to paint! Here is part of the reason why I labored so long. At the time, I was recovering for a very bad accident. I was in chronic pain, and partially disabled with spinal and nerve, disk and vertebra compression from a serious neck injury. Sometimes, I waited for hours or days for my hand to stop shaking (from nerve damage), so I could resume painting. This painting was my emotional therapy while I went through a painful recovery and physical therapy that took over 2 years. The story I related to on several levels and was the time and era that my parents experienced. They would watch this plane depart from Treasure Island and fly out over the Golden Gate Bridge at the San Francisco, and fly to exotic islands far from their troubled world of the Great Depression. This painting is about America coming back from the Great Depression, flying through golden dreams, surviving leaving behind the terrible Great Depression and into the dark cold realities of a Post War Era, if cold war politics and the Atomic age. This image, the plane itself embodies the will of the people of America and my parents of the Greatest Generation, to dream, to work, and do great things. This they did. This plane was a symbol that America could and did survive the Depression and was both innovative, creative and industrial powerhouse on a very dangerous political world stage. This plane, featured in both 1939 Worlds Fairs, told a unspoken truth, that if we could fly tourists and businessmen to China, we could fly bombs to our enemies should the need arise. Pan Am and it's remote island bases then became a defense strategy and pawns in the Pacific. This messages was taken seriously by the Japanese, who not taking the bait, went first to the queen and attacked the "Pearl" and then knowing the importance of these so called civilian Pan Am Bases, immediately attacked them. So famous our loss of Pan Am's Wake Island that a propaganda film and war cry of "Remember Wake!" became as loud as "Remember Pearl Harbor". So important were these civilian planes, in both actual and implied importance, that all of Pan Am Clipper bases of the Pacific routes were under attack or threat in the days after the bombing of Pearl Harbor. In December 1942, This very Pan Am Clipper left Pearl Harbor, on a scheduled flight to New Zealand, and was just out to sea before the bombing of Pearl Harbor. To escape the enemy held Pacific waters this plane flew unscheduled around the world. It was this Art Deco plane that was a harbinger of modern things to come and elevated and celebrated at the 1939 World's fair in NYC and the 1939 Treasure Island Worlds fair in S.F. California. My parents and other young people would watch these flights, and see the rich and famous boarding calls! These were powerful Boeing Flying Boats, swinging 2 story high propellers with 3000HP engines. Roaring out low over the Golden Gate, flying to far away places, unattainable places, for the common working man, all very much an opulent dream during the great depression, that ended with our entrance into the great war. As a side note: The local California Chinese raise millions of dollars during the great depression and sent this money back often on the Flying Boats to China to help in defense against the Japanese. Flying Tigers, an all volunteer American P-40 fighters before "Pearl", went to help China traveled on these Pan Am Clippers. This as as well as spies, defense contractors, news photographers, Japanese ambassadors. Besides movie stars like Clark Gable, and the rich soft handed world travelers, these planes held a microcosm of a world in upheaval with nefarious political and financial goings on while each leg of the journey to Hong Kong could take 12 hours or more and the trip a rocket speed of 6 to 7 days with stops at Island resorts mostly owned by Pan Am on the way. These planes had only first class and better service and accommodations, including dinning room area, prepared hot meals, fine wine and drinks, deserts, bathrooms, and even a private suite with your own private dressing area and bathroom! Sadly all of these planes were used up, doing war work and after sold off and scraped. The last Boeing 314 was left abandoned in Long Beach, where Pan Am had a close sub office. In 1953, it was taken out to deeper waters just of Long Beach, California and simply ripped open and sunk. Thus ended the golden age of the luxurious flying boats, and mighty "Flying Clippers of Pan Am". Their main Admin Building, Hangers and "Clipper Cove" can still be seen at the entrance of Treasure Island, (SF), Ca. These buildings appears pretty much as it did during the 1939 Fair. Treasure Island was one of the ship yards my father worked at for the Navy and Defense Contractors during the War. This original painting is available and can be seen at Vanguard Gallery, #1 Clint Eastwood Building , Carmel, Ca. Larger on canvas giclee prints, Signed limited edition PRINTS can be ordered via email request and listed on this Vanguard ETSY.com. (C) "Last Flight" painting, art and articles, all by Daniel Vancas 1993-2010 all rights res. 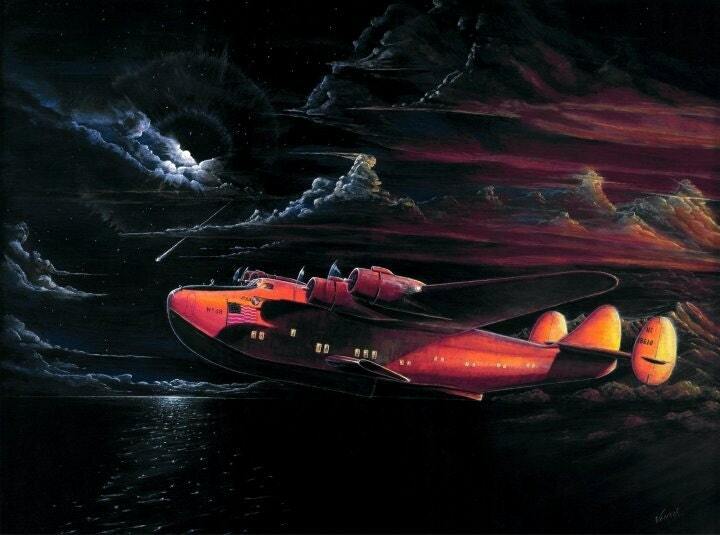 Note: This is from several earlier published articles I wrote about "The Last Flight of the Clipper" and Pan Am Flying Boats with my feature painting, started in 1993. This painting of 250 layers took me over two years to paint. In those dumpsters was Normal Rockwell, Gil Elvgren, Earl Moran, Mabel Rollins Harris, Henry Clive, Zoe Mozert, MacPherson, Pearl Frush, Al Leslie, Henry Hintermeister, Roy Best, Art Frahm, Billy Devorss, Runci, Munson, Thompson, Ward, and that is just to name a few of the many lost artist's work from wide ranging genre' of religious, nature, nudes, Pulp Fiction, pin-ups, Calendar, pinup and advertising. So anything that survives today, even if preserved or recreated thoughtfully is indeed precious. THE CHINA CLIPPER: in 1936 Pan Am made it's first historic fights to Honolulu. This image was created to celebrate this first flight, of a 130 Martin Flying boat. This was the first leg of the journey to China. This image has Hula Girls, Surfers and Wave Riders in catamarans. With swaying palm trees and the great China Clipper, what more could you want in a recreation of a vintage travel poster? 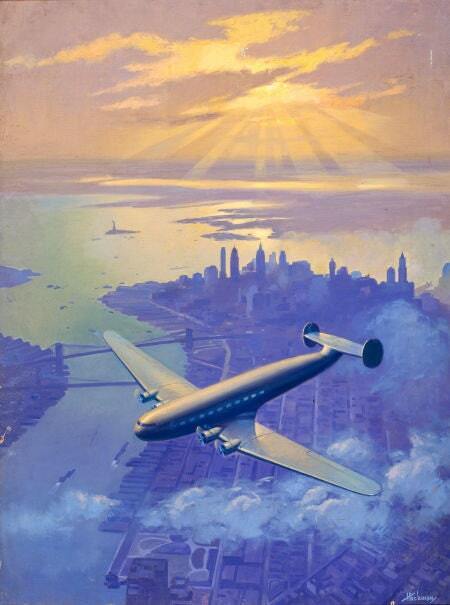 BACK IN TIME: A Historic Perspective of early transoceanic air travel - The country was in a grip of a great depression in the 1930's, when this painting was made for popular calendars and art prints. Yet people still dreamed of, and a few did manage travel, even if underemployed. The young and out of work, which was 25-50% depending on regions, hitched a ride, used buses, trains, and if no ticket, jumped a freight. There were a few jobs on ships if you really needed to see the world, there was always the Navy! Did you know that a round trip ticket in 1938 to Honolulu on this China Clipper cost the same as a Down Payment on an average home in California? The RT ticket to China and back cost the same as a new Cadillac Car, or a Down Payment on a fine new custom large home, with enough left over to buy some furniture? Yes, in the great depression, their was a wealthy 1% who kept getting richer, often on the backs of growing poverty. Still, the glamour of travel by air was a dream so out of reach, to my young parents dating, they and their friends, loved watching the boarding calls of celebrities and movie stars taking off on the Clipper out of Treasure Island, ( Also the sight of the 1939 Pan-Pacific World's Fair), San Francisco. To imagine then of a flight on the Clipper, was so out of reach, that it was like wishing today that we could fly to the space station. Despite what you imagine, the accommodations on these Flying Pan Am Clippers, were first rate and service, perfect. The food like a fine restaurant, with an actual dining area, and full course meals. There was, full cook galleys, refrigeration, and an expert staff to serve you. Guests, as you imagined, dress to the 9's, as was the custom for air travel and remained so until the 1980's. You typically left San Francisco at 4:30PM in the afternoon and arrived in Honolulu around 10:30 AM the next day. Now that was fast, in the 1930's, when a ship, the only other way to the islands might take 6-7 days. Daniel Vancas has been a artist most of his life. He returned to his first love of painting full time after a serious life changing accident in 1991. He loves the period of the 1920's through the early 1960s, Deco to Modern and illustrative style that infuses his work. 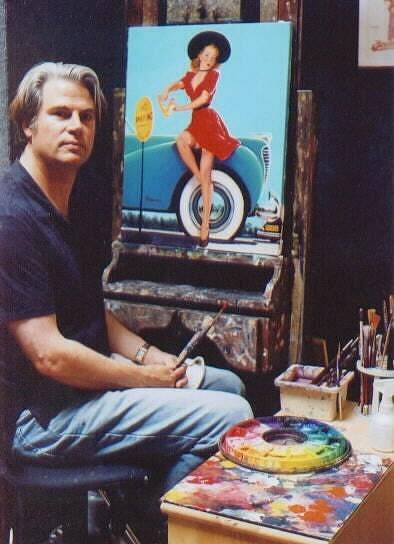 With full authority and rights, since 1995 He painted more than 238 replicas of historic Elvgren pin-ups. Photo's of the artist, Daniel Vancas at Elvgren's easel at work on other commissioned paintings. Daniel Vancas is a fine artist and fine art publisher of limited editions. Known mostly for his work in pinup, illustration, aviation and automobile art. He was the very first publisher of fine art Elvgren limited editions, and also the very first to commercially offer high quality Elvgren Replica paintings. He promoted Elvgren for 15 years at his own expense of over $1,000,000. As a proud owner of the Elvgren trademarks, Daniel Vancas has use these marks continual since 1994, 1st issue 1997 and re-issued, Backed by Permanent Federal Court Order, 2001. 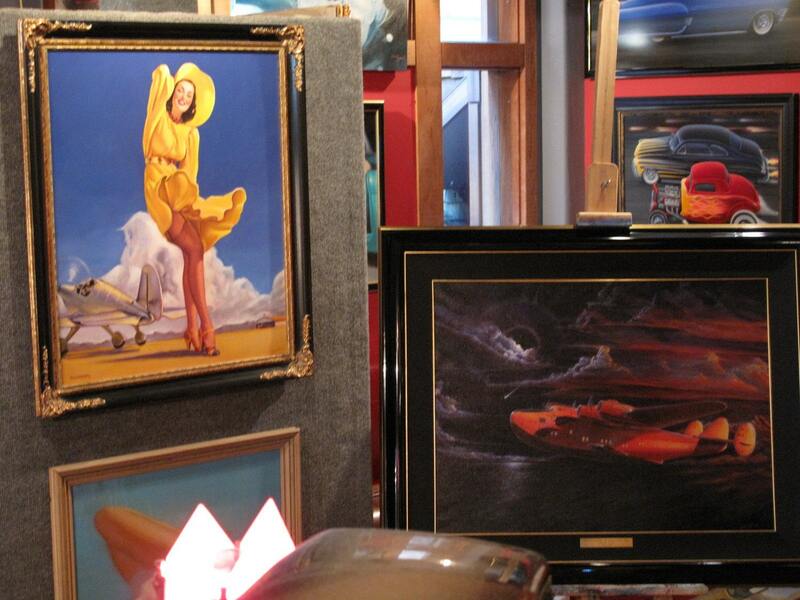 Please see our other listings of Flying Boats, Aviation art and pin-ups. AS WE WERE THE FIRST TO BRING TO THE RETRO NOSTALGIA AND THE GREAT PIN-UP REVIVAL - PLEASE ACCEPT NO SUBSTITUTES!